It all started with an innocent post on Facebook. My niece posted a DIY paint recipe for kids and wondered if anyone had ever tried it. I thought… paint? kids? DIY? I’m in! Recipe 1: No cooking required. Equal parts flour, salt and water. Mix and then add food coloring for color. The original recipe called for 1 Cup each of the three main ingredients but I thought that was overkill for my purposes so I went with 1/3 C each to start. The consistency at this ratio was a bit like nearly cooked playdough. VERY gritty from undissolved salt with flour lumps like your Aunt Sally’s Thanksgiving gravy. My kids didn’t even want to touch it, and they love a good mess. So, not one to give up on a good try, I watered it down… like double… and salt remained… and lumps remained. What was I missing? So off to the internet I went! Found 3 additional recipes and decided to try them all! 1/3 C water mixed with 1/3 C flour. Stir until consistency is smooth. Mix in 2 teaspoons salt. (any more with this ratio of flour and water will make the paint gritty) Stir well. Altogether quick and easy and the thick paint spread consistently and smoothly- with both a brush and a finger! 1. Mix the sugar and flour in a saucepan and slowly stir in the water. 2. Cook over medium heat for 5-7 minutes, stirring constantly until the mixture is a smooth gel. This change happens quite suddenly at medium heat, so be prepared. 3. Stir in the soap and remove from the heat. When cool, scoop it into separate storage containers with lids, dividing as desired. 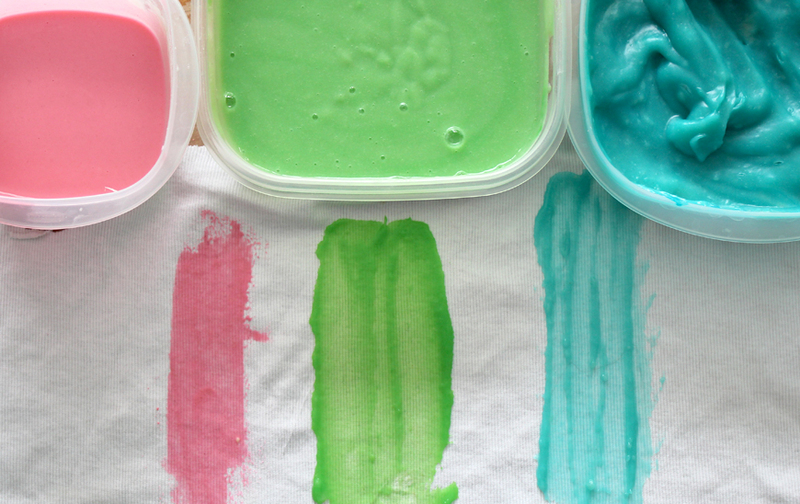 Add food coloring until your desired shades are achieved. The original recipe called for cornstarch (1/3 C) which they thought was better than flour and the original recipe calls for low heat for 5 min… Well, on my glass top range, it was NO where near a gel after 12 minutes so I cranked that sucker up! If I am standing and stirring constantly, it better get done now! Again… wee people wait for no recipe! This recipe is VERY close to the original out of a jar finger paints you remember from being a kid. Thick and goopy with a nice satisfying spread. Lovely finger paint consistency. Mix flour and water together in saucepan until smooth. Add in salt and sugar. Over medium heat, stir constantly until mixture thickens consistently, about 5-7 minutes. You will begin to see lumps reappearing in mixture as the mixture starts to thicken, no worries, its normal, keep stirring! Once consistently thick, remove from heat. 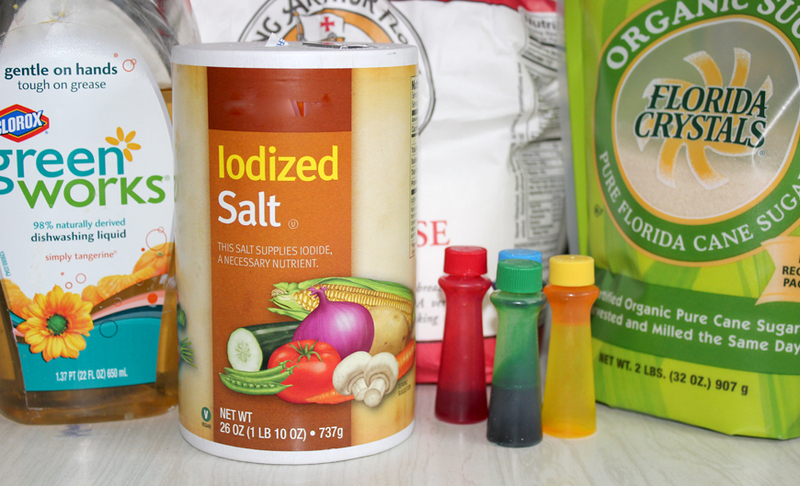 Divide into lidded containers as desired and add food coloring until desired color is achieved. 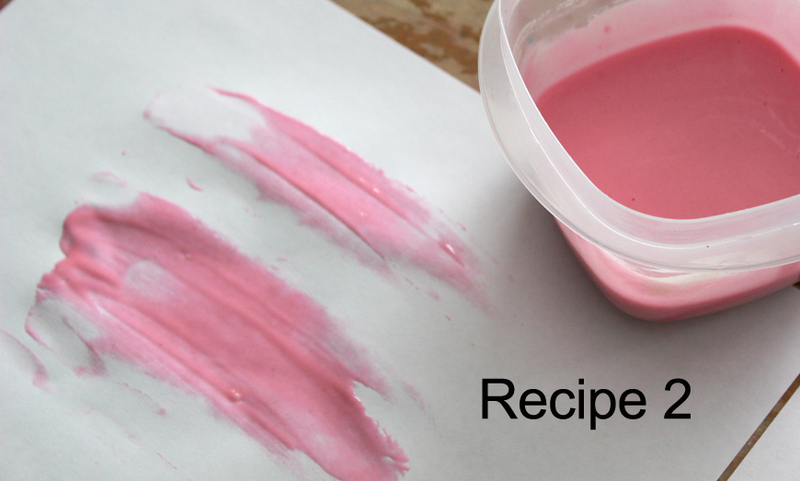 As with recipe #3, this recipe is very much like the fingerpaint we know and love. 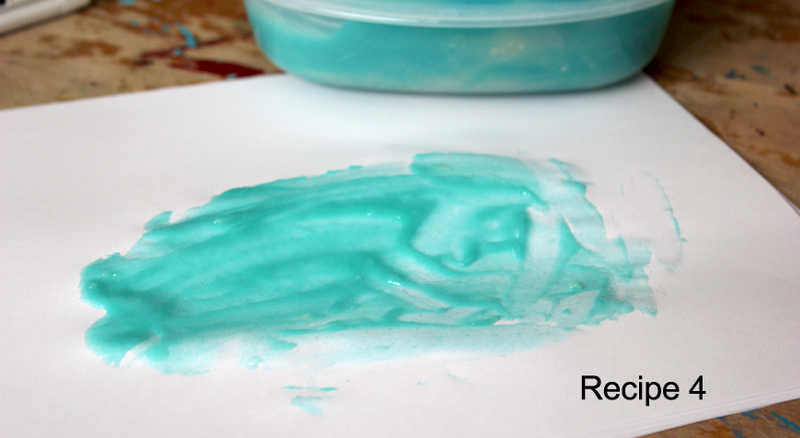 Smooth and silky, lots of fun to glob onto your paper! This recipe is WAY thicker than recipe #3. I was surprisingly happy that once I added the food coloring to the recipes, none of them stained my hands. YAY! So the next question was… how would any of this come out in the wash! It is supposed to be for kids after all. So I globed some serious paint on a cotton rag and let it sit. A quick rinse in the sink under water did not bode well for the home made paint, with all of the dye color left behind for recipe 2 and 3. Recipe 4 rinsed out a little better but still remained. So off to the washer it went. In a regular wash cycle (as in nothing really special done), each of the paints left behind a bit of color on the white cloth. Recipe #4 was nearly all gone but I am not sure if that is due to color used in it (blue vs. pink or green) or due to the fact that it was still a tad bit tacky. The nice thickness does not lend itself to fast drying time. I guess I wasn’t surprised- no chemicals and food coloring has to leave its share of stains, so plan for messes accordingly! 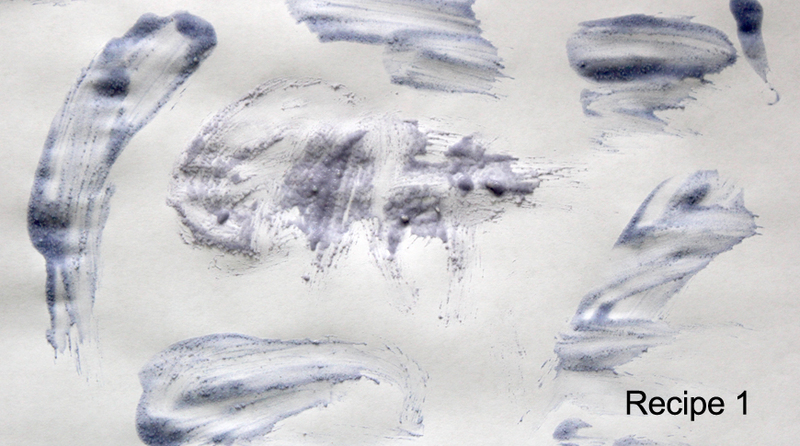 So, three solid paint recipes- Recipe 2 if you like a more traditional paint, not so thick. Recipes 3 and 4 for more traditional finger paints. Recipe 4 definitely if you are concerned with ingestion. Not sure of the shelf life of any of these guys, but they all seem to have 2 basic ideas… flour for thickening and then some sort of preservative- either salt or soap. If you give them a try, I would love to hear what you think… which one you picked and what you made! Just leave me a comment!